Mindy's out of town this week, so she has no say in the pick. Mark liked this one. Mark's pick for the week. The banter at Batburger did amuse Mindy as well. Mark's pick this week harkens back to his love of Adam West's Batman. This was a step up from the awful Wonder Woman '77/Bionic Woman comic of a few weeks back! Mindy is picking a different comic than Mark. She is enjoying this new Wonder Woman run very much, and thanks Greg Rucka for the story thus far. Mark's pick this week is the annual of Black Hammer. Officially, Black Hammer Giant-Sized Annual #1. Mindy hasn't finished reading the comics, but would probably go along with this one. Mark really liked the throwback cover, as well as the story that brings back the Rogues. Mindy has her own pick this week. She really looks forward to this run of Wonder Woman, unlike the last. This is very good, if outside the continuity of the current SG book. Both Mark and Mindy pick this one! Mark's pick, again. Mindy admits she is way behind on her reading and hasn't gotten to this yet. However, one has to remark on the "on-time"ness of this. DC and Vertigo could use a lesson. Mark likes this one. Mindy understands continuity shouldn't matter, but cannot reconcile in her mind the Harley (Suicide Squad)/Harley (her own book) dichotomy. Mindy thought that a holiday special was due. Mark really liked it, too. Mark likes the reworking of Batman origin story. Mindy has really been enjoying Alias this week, even if it wasn't in the pull. Mark and Mindy are both fans of Jeff Lemire and Scott Snyder. Young Animal is doing a great job. Both Mark and Mindy are really enjoying this new Doom Patrol. We both liked this comic a lot; it was a great intro to the Super Sons book that is upcoming. But Mindy still questions releasing this the same month that Damien is kidnapping the future Teen Titans. 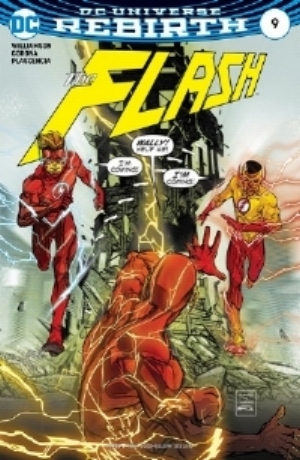 Mark's pick this week is "The Flash" (#9). The cover is reminiscent of "Flash of Two Worlds" but featuring both Wallys/Kid Flashes.